Besides Translation Memory and Glossary, there are a few other tools – and things you should pay attention to too – which can be helpful as you translate. The History tab shows how the selected string was translated in the past and is useful as a reference. You can quickly access the History tab using the Ctrl+3 keyboard shortcut. The Glossary tab shows information about any glossary terms found in the string you have selected. Switch to that tab using Ctrl+4 keyboard shortcut. See Using the Glossary for more. 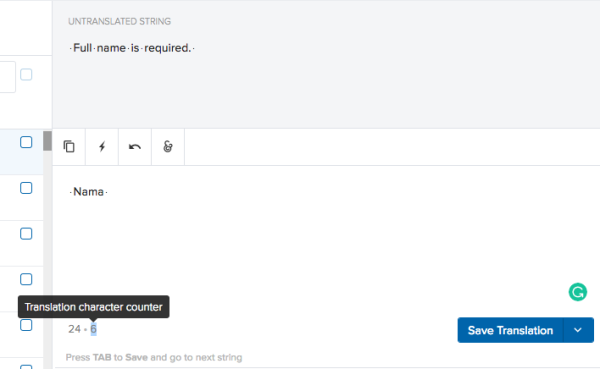 If you have a question about the meaning of a string or see an error, you can leave a comment and/or open an issue. You can submit your comments and discuss the translation with other collaborators or ask any questions related to the source string. How can I find strings with comments in the Editor? To find all the strings that have at least one comment, use the Comment filter followed by *. To find a specific comment, use the Comment filter followed by a keyword or phrase in the comment. For example, "Comment: context". To find all the strings that include comments that have been marked as issues, use the Issue filter and select the "yes" option. Issues are meant for typos or grammatical errors in the source string. In this case, you can open an issue and the project's maintainers will be notified so as to proceed with the necessary fixes. However, vendors/translators working in Transifex, might use Issues to ask clarification questions about the strings they're translating. Opening and closing issues is an excellent way to track which questions have been addressed and implemented and which ones haven’t. 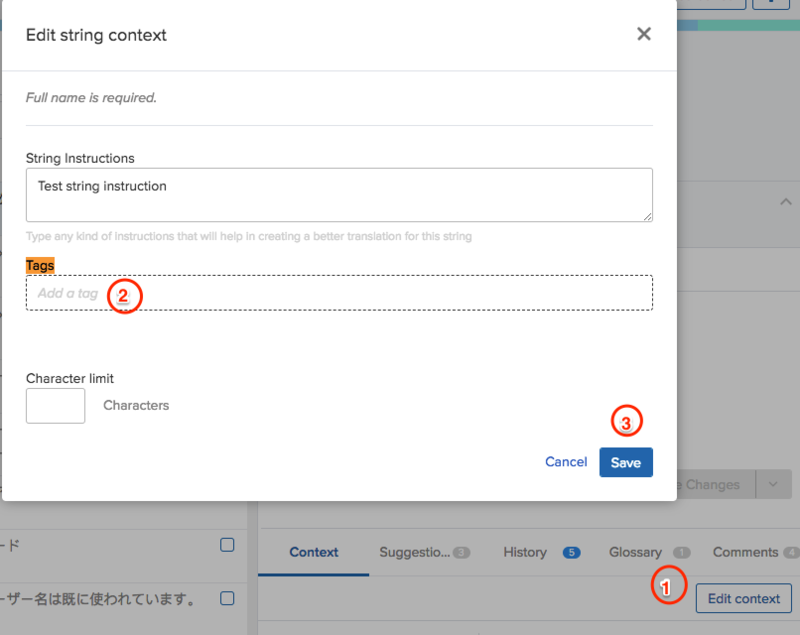 Comments and issues can be viewed by any collaborator of the translation team: so if one translator asked a question about a string, all other translators/reviewers will also see the question and answers and won’t need to ask the same question again. Issues can also be filtered in the Editor: Label > Issue > Open/Resolved/None. With a string selected, click the Comments tab or use Ctrl+5 keyboard shortcut, then hit the Comment button. Enter your message into the comment box. Hit Add to simply add a comment, or Add as issue to add a comment and mark it as an issue. Project maintainers will immediately receive in-app and email notifications when an issue is created. If you want to leave a comment for a specific user, you can @mention them. Simply type @ followed by their username. The recipient will receive in-app and email notifications and will be able to go to the mentioned string(s) right from the email. You can tag admins, project maintainers, and any active user that belongs to the project's team. 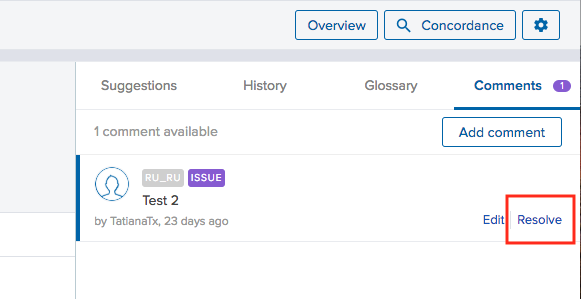 Once the question that was added as an issue has been answered by you or your teammate, and a translator or reviewer updates their translation according to the information received, the Issue needs to be marked as Resolved. This way it will not appear as an open issue anymore. Who can mark the opened issues as resolved? Sometimes a developer might include notes about how a string is used within an app or there are translation instructions for that string. These notes appear between the source string and the translation box. Developer Notes are imported within the resource file. String Instructions can be added by clicking on "Edit Context" button, in the Context tab. 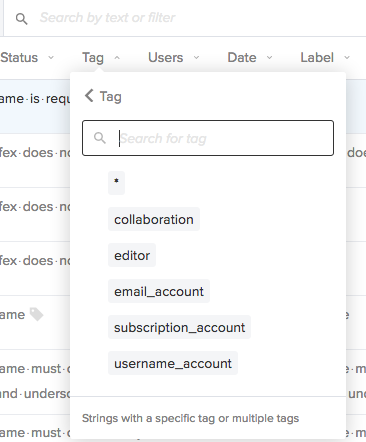 Tags let you group a set of strings within a resource in any way you like. For example, you can use tags to specify where certain strings came from, or prioritize strings for translation using a tag called "Urgent." Tags work on a string level, and when you add a tag, it is applied to all languages, even if you have selected a specific language in the Editor. To tag strings, first select one or more string using the checkbox to the right of each string. Then in the Edit tags section, type in a tag, and hit Add. 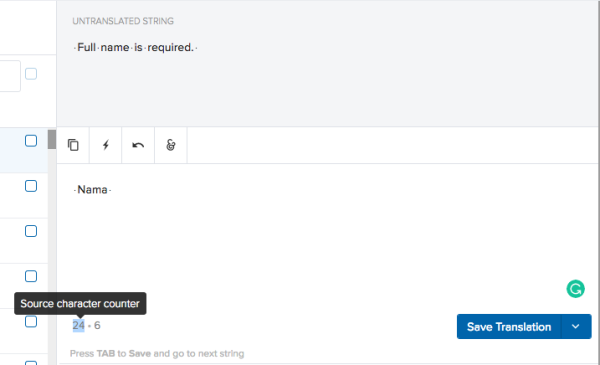 When adding a tag to multiple strings, when you start typing, you will see a dropdown with suggestions of the existing tags in the current project. Another way to add tags to your strings is via the Edit context button that is available under the Context tab in the editor. Similarly, here, if you start typing in the “Tags” area, a dropdown with suggestions of the existing tags in the current project will be available. Also, Transifex supports two smart tags locked & notranslate. These tags allow you to lock a string or prevent it from being translated into other languages. More information about these tags can be found here. Only maintainers and administrator users have the privileges so assign tags to source strings. If you need to modify the translation of a word or a phrase en masse, you can do so using the find and replace functionality in the Editor. You can search for the entire word or parts of the words (or a character, for the non-space languages). First, select the strings containing the word or phrase you want to update. 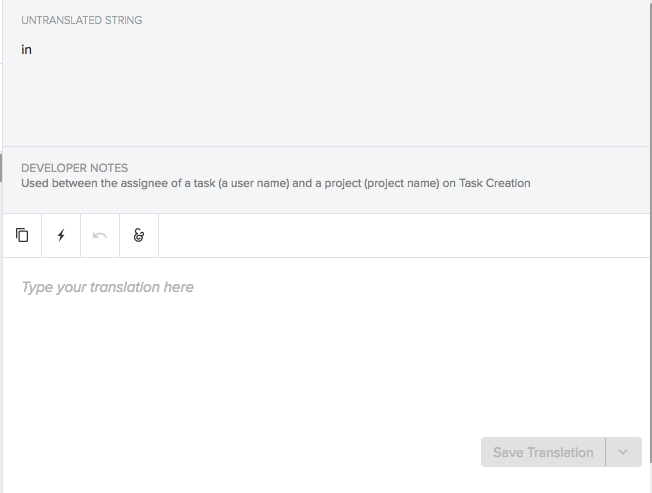 You can use the filter "translation_text" in order to easily find these strings in Transifex Web Editor. Or you can select all strings in this project, if it's a global change. Then in the Find and replace section of the right panel, type in the word/part of the word you want to replace and below that, the new word you want to use instead. Finally, hit Find and Replace. If you're searching for a part of the word, click on Allow partial matching before hitting Find and Replace. The Editor supports a number of keyboard shortcuts so you can quickly take actions without using your mouse. To see all the available shortcuts, enter the Editor, click on the Gear icon in the top right corner of the header, and hit Shortcuts. 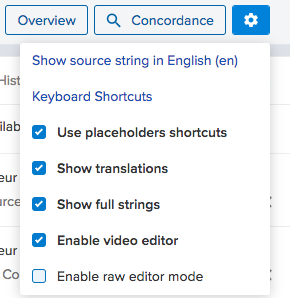 If you're translating to two similar languages, such as French (France) and French (Canada), you can view the translations of one as the source strings when translating the other. If, for example, you translated your content from English to French (France), you'd be able to see your French (France) translations as the source strings when translating to French (Canada). From within the Editor, click the Gear icon in the top right. Select Show source string in X. In the popup, select the translation language that you want to see as source strings. 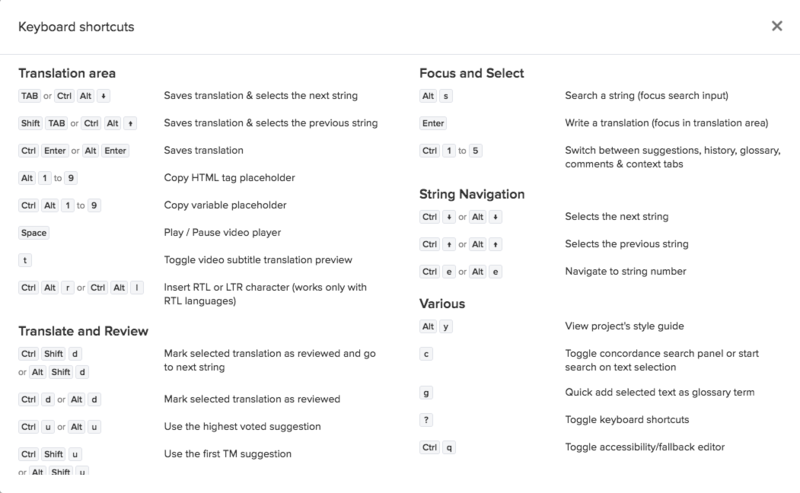 Once you select a string from the string list to translate it there are some tools and functionality that you can use in the translation area. The area where the source string is displayed has some functionality that you can access using your mouse. Clicking on an active element in the source string will copy a part of that active element to the translation string area. When one of these characters is present in the source string there is a visual representation so that you know what control character is there. 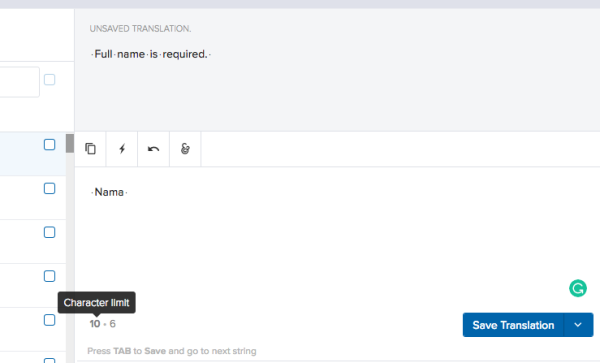 You also have the option to click on it and copy it to your translation. In order to protect variables and HTML tags that exist in the source string, Transifex replaces them with special placeholders. When you click on those placeholders in the source string area they are copied in the translation string area. Alternatively use the keyboard shortcut Alt+number to copy an HTML placeholder, or Ctrl+Alt+number to copy a variable placeholder. 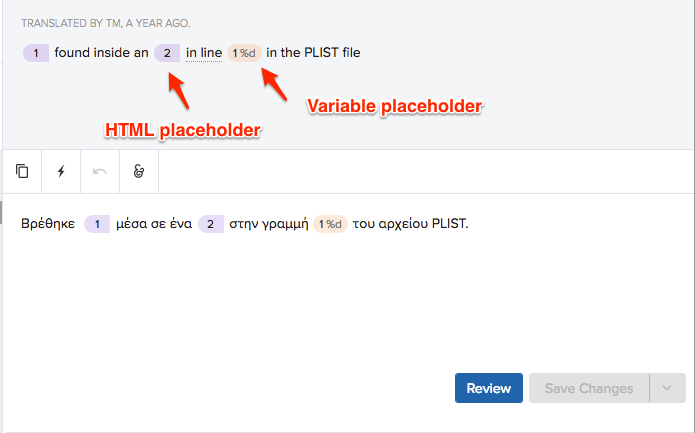 See Translating HTML Content for more details on what you can do with placeholders. When Transifex identifies that a word in the source string is also in the glossary, an underline is added to that word. When you hover on that word in the source string area you will see a tooltip with the translation of that term in the target language you have selected. Clicking on that term in the source string area will copy it's translation to the translation string area. See Using the Glossary for more details on how to use the glossary in the Editor. 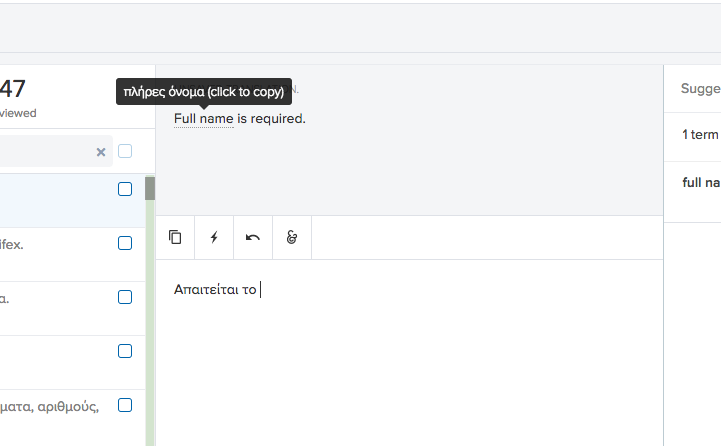 Copy source string – Copy the source string into the translation box (you'll still need to hit Save). This is useful if you're translating between two similar languages, such as English (United States) and English (United Kingdom). 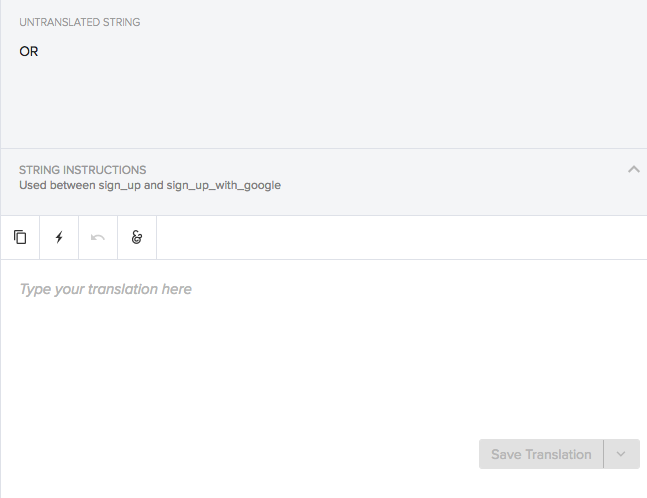 Machine translate – Use machine translation to translate the string. You'll need to have Machine Translation set up first. Revert translation – Reverts any changes that you have made to the translation. If the string was untranslated then it clears your translation, otherwise reverts to last saved translation. 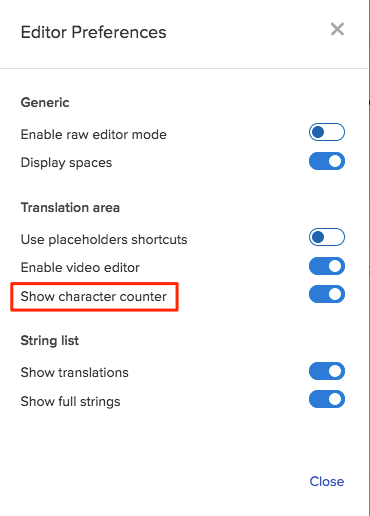 Add special character - Insert special characters into the translation box (see below for details). This is a dropdown that holds some common special characters so that you can easily add them while translating. Click the Special characters button . 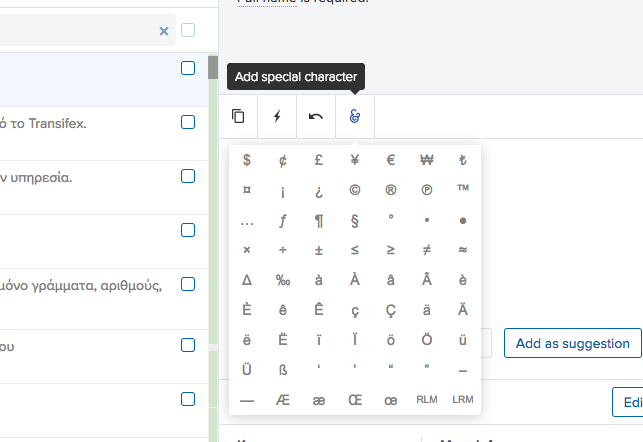 In the dropdown, click on the special character you want to add. Special characters RLM and LRM are used to change the way adjacent characters are grouped with respect to text direction. Check out Right to left mark in Wikipedia for more information. NBSP adds a non-breaking space (Unicode U+00A0) to the translation. 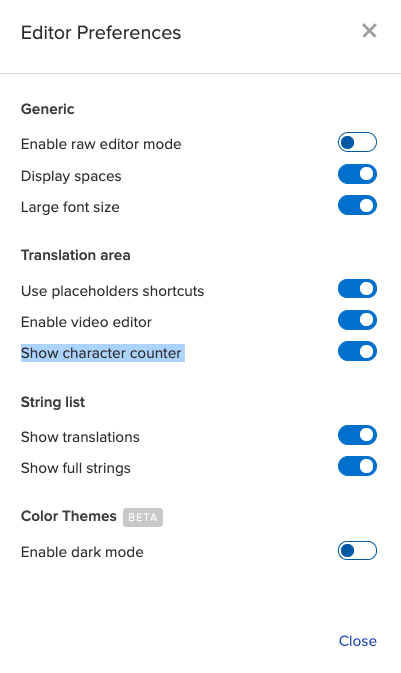 Depending on what you are translating, you may need to keep a translation within a specific character limit in order to not break the user interface (for instance, in menus, buttons, and mobile apps where space is constrained). 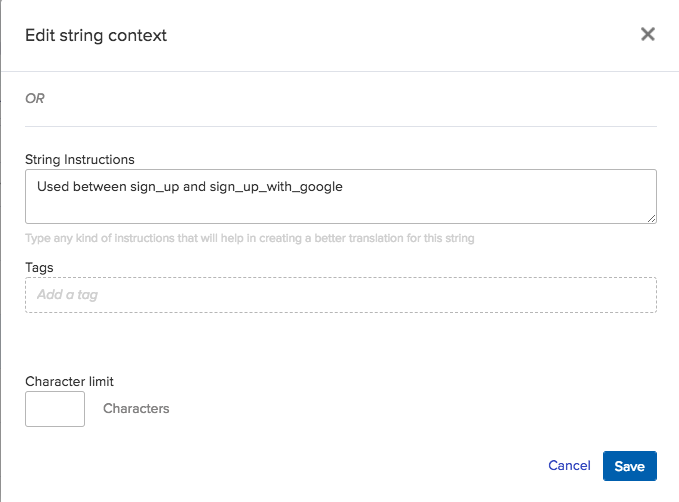 In Transifex, you can set up character limits to make sure the translation meets this requirement. Enter the desired limit into the corresponding field. 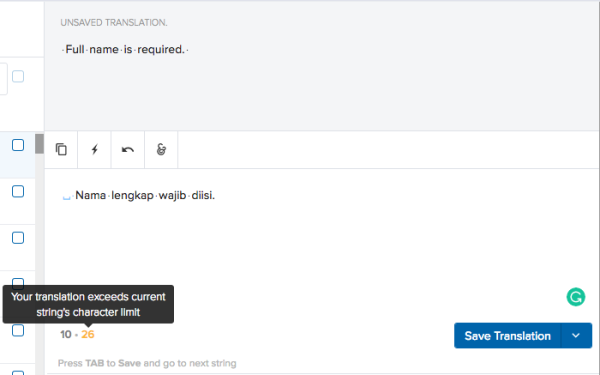 A translator would see two numbers in the bottom left of the translation box: character limit (10 on the screenshot) and a translation character counter (6 on the screenshot). If a string has a character limit and contains placeholders, then those placeholders are not contributing any characters for that character limit. If the character limit is not set, the character counter will be displayed as follows: source character counter on the left and translation character counter on the right. If the character limit is set up, the character counter will be displayed as follows: character limit on the left and translation character counter on the right. The default mode of Transifex Editor is the rich mode. In this mode it is easier to work when you are a translator and want to focus on translation and context, hiding and protecting all technical details that usually don't offer any value to the localization process. Still there are cases where you want to have full access to the exact source string as this is stored in the database. To view the exact source strings without the placeholders for variables and HTML tags you have to use the Editor settings on the top right corner of the editor page. For usage details on the above please see tools in the translation area.